10am to 5pm, seven days a week. Yao Ming, global humanitarian, vintner and retired NBA star, opened a new hospitality center for his YAO MING® and Napa Crest wines in Napa Valley in February 2016. Just walking distance from downtown St. Helena, Yao Family Wines is a sophisticated and relaxing space to taste the basketball superstar’s collection of Napa Valley wines in style, surrounded by mementos of Ming’s sports career and philanthropic passions. The expansive marble-topped oval bar and intimate lounge spaces accommodate groups as well as private guided tastings. Yao Family Wines Collectors Circle members enjoy a comfortable private club lounge and outdoor patios shaded by olive trees. Tasting offerings include three menus: the Access Tasting with two Napa Crest wines and the YAO MING® Napa Valley Cabernet Sauvignon ($35), the Reserve Tasting with Napa Crest Red Blend, YAO MING® Napa Valley Cabernet Sauvignon, YAO MING® Family Reserve Cabernet Sauvignon and a cheese plate ($50), and a Library Tasting including three of our limited YAO MING® Family Reserve Cabernet Sauvignon ($80) served with a cheese plate. 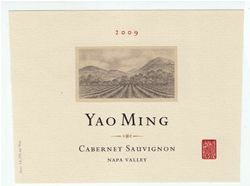 Yao Family Wines is open seven days a week 10 am to 5 pm at 929 Main Street, St. Helena, California. Private appointments and walk-in tastings are available. Guided tastings are available in Mandarin. Call 707-968-5874 or visit www.yaofamilywines.com. We provide toys and coloring books for kids so that the grown ups can enjoy a little wine! The expansive marble-topped oval bar and intimate lounge spaces accommodate groups as well as private guided tastings. Yao Family Wines Collectors Circle members enjoy a comfortable private club lounge and outdoor patios shaded by olive trees. Tasting offerings include three menus: the Access Tasting with two Napa Crest wines and the YAO MING® Napa Valley Cabernet Sauvignon ($35), the Reserve Tasting with Napa Crest Red Blend, YAO MING® Napa Valley Cabernet Sauvignon, YAO MING® Family Reserve Cabernet Sauvignon and a cheese plate ($50), and a Library Tasting includes the 2010, 2011 and 2012 limited YAO MING® Family Reserve Cabernet Sauvignon ($80) served with a cheese plate. Wine Education: Our knowledgable staff can tell you all about how we develop the balance and elegance that are a hallmark of our wines. Food Available: We feature cheese and charcuterie plates with our tastings. To join the wine club, visit www.yaofamilywines.com or call 707-968-5874. The Yao Family Wines Founders Club is a way for members to enjoy exclusive pricing on wines and benefits through the winery. Limited to just 200 Members, The Founders Club lets you enjoy four regular shipments of our releases for your cellar, including exclusive access to our Family Reserve Cabernet Sauvignon. You will also receive special pricing, complimentary tastings and VIP treatment at our tasting room. Founders Club Members receive three bottles of the YAO MING Family Reserve Cabernet Sauvignon for their fourth shipment, along with an exclusive purchase allocation for additional bottles.